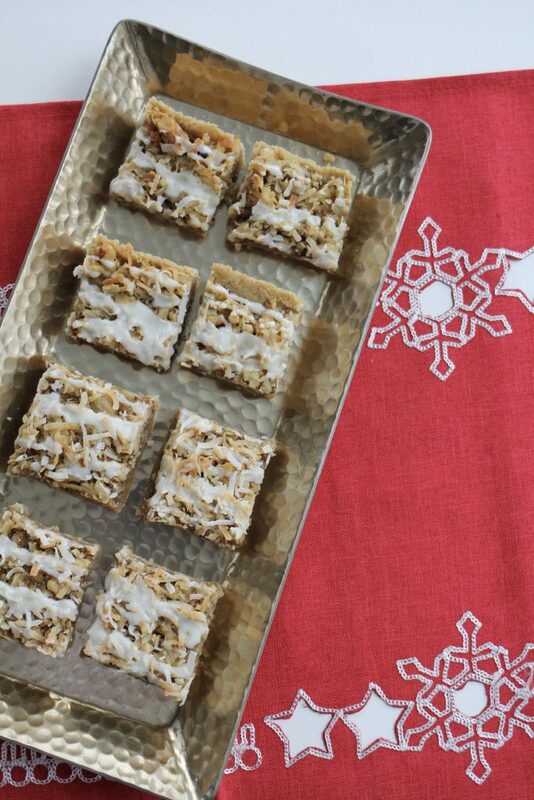 Every Christmas cookie lineup should include a good bar cookie. 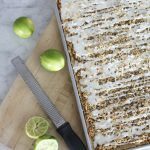 Coconut Lime Bars have a buttery crust, a thick layer of nutty-coconut goodness and are topped with a fresh lime glaze that sets this dessert apart from every other bar cookie you have ever eaten! My friend Laurie, who has contributed several recipes on this blog (type “Laurie” in the search bar) gave me this recipe while she and her husband Raymond were serving as mission presidents in Wisconsin. As a mission president’s wife, the mission home is often filled with missionaries and occasionally, visiting church leaders who need to be fed! There is no doubt in my mind that the missionaries of the Milwaukee, Wisconsin Mission were very well fed when they stopped by the mission home! Laurie is a master of perfecting recipes, and also serving the masses. This recipe can be cut into 60 pieces. Yes 60 pieces. It’s a rich little bite of coconut and lime goodness. A few tools I use to make these bars quick and easy are listed here…The butter crust is simple to make, I used a cake decorating spatula to smooth and flatten out the dough in the bottom of the half sheet pan (18x13x1) . 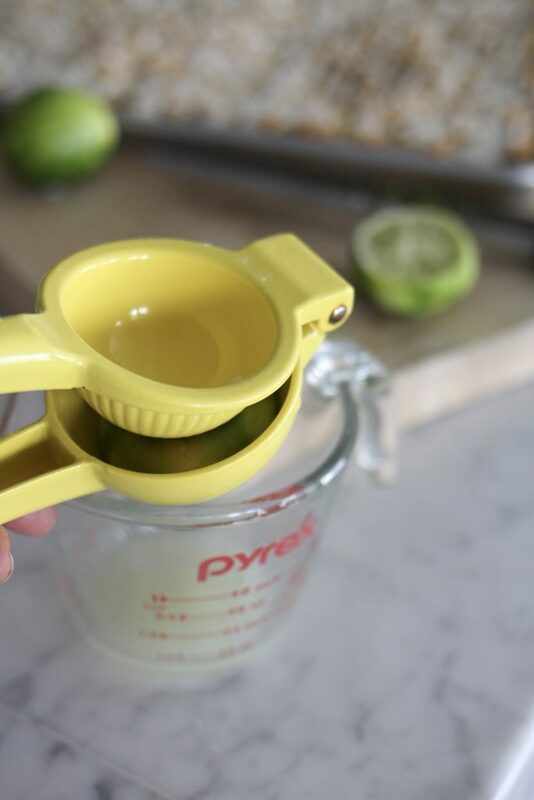 For zesting the lime, my favorite tool is this microplane grater. I’ve had mine for years and it’s the only way to finely zest any type of citrus fruit or grate parmesan or other hard cheeses. Juicing is really simple with this hand held juicer. I use mine several times a week. If your lemons or limes are a bit on the hard side, set the fruit in the microwave for about 12-15 seconds. It will produce more juice if heated up a bit! I always look for limes and lemons that are easy to squeeze, instead of firm. 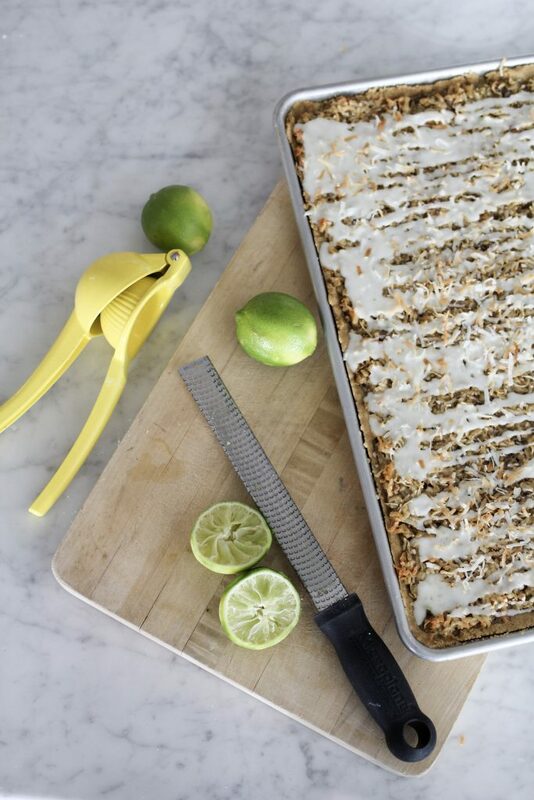 Coconut Lime Bars have a cookie crust bottom with a filling similar to the nut and coconut layer on our favorite German Chocolate Bundt Cake. But not quite as sticky. The coconut browns up a bit which give the bars a bit of a golden color. After the bars are cool completely, they are topped with a fresh lime glaze. 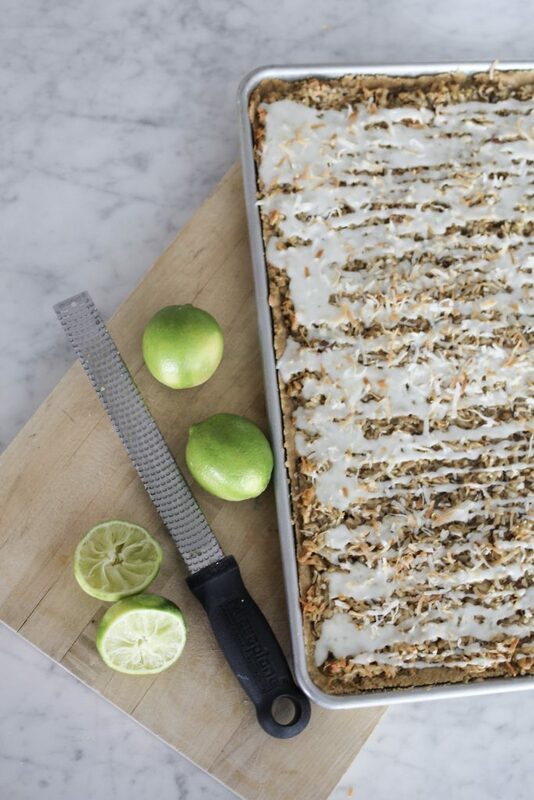 The lime glaze totally sets this cookie bar apart from every other cookie bar you’ve ever eaten. Make sure to use fresh limes. It totally makes a difference in this recipe! 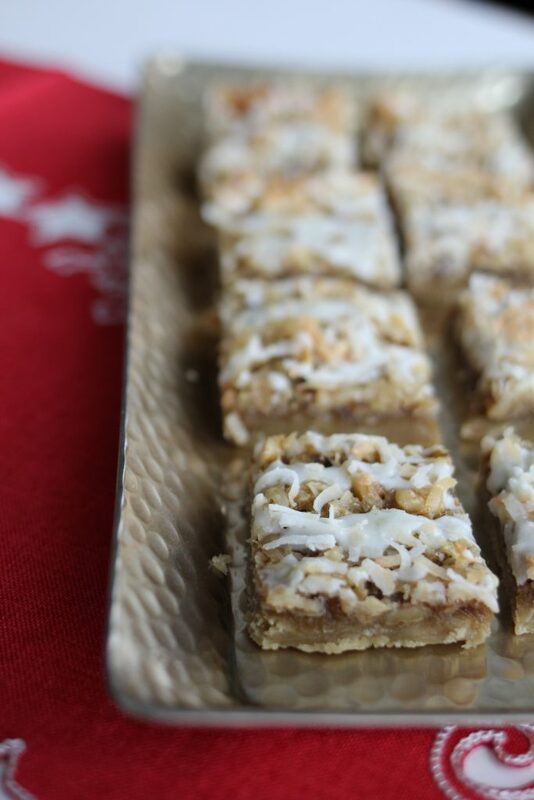 I am sure we will enjoy Coconut Lime Bars all year long, but I think they make a perfect dessert on a buffet table at holiday time. I made a batch and after the bars were completely cooled, cut them into small pieces. I cut six across and ten wide, equalling 60 bars. I’ll just take them out as we need them for parties, cookie exchanges, etc. 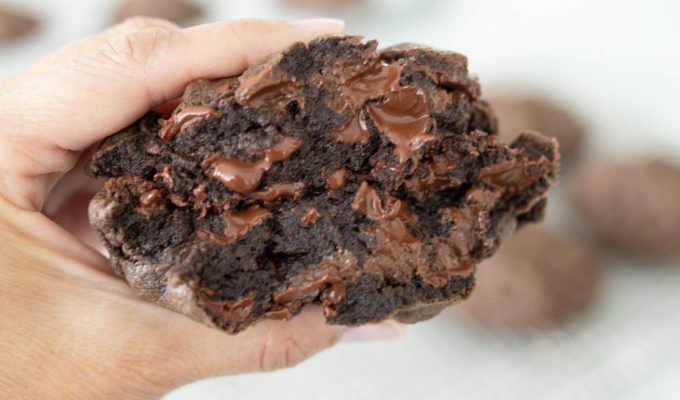 This recipe is simple enough for a beginner baker, but looks like you’ve been hanging in the kitchen with the likes of Ina Garten. Preheat oven to 350 with rack in center of oven. Place the flour, softened butter, brown sugar and salt into a mixing bowl. Mix until all ingredients are combined. Press the mixture into lightly greased jelly roll pan (half sheet pan) on the bottom and up the sides a bit. Bake for 15 minutes, remove from oven. While the crust is baking, mix all filling ingredients in a bowl. Pour filling mixture over crust and smooth out with spatula. Whisk together lime juice and powdered sugar. Drizzle glaze over bars when completely cooled. 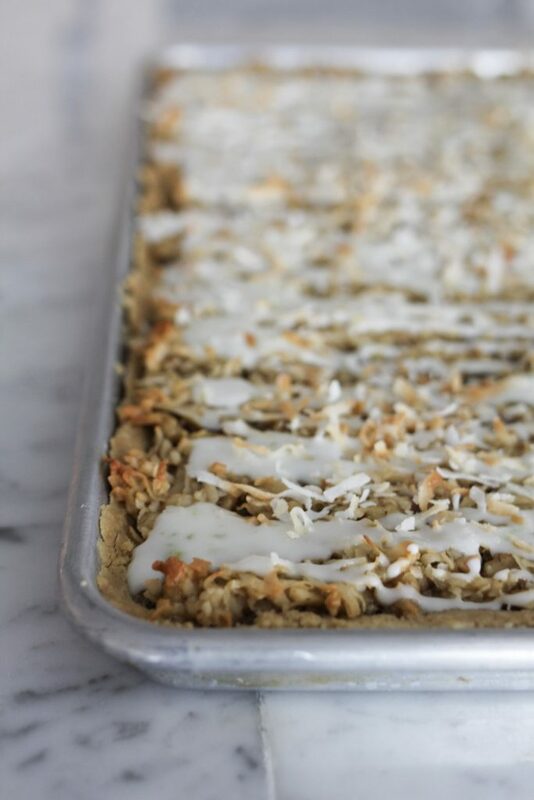 If desired, sprinkle top of bars with about 1 cup toasted coconut. Cut into bars when cooled. Looks delicious! Should I use unsweetened or sweetened coconut for this recipe? Try substituting 1 1/2 cups white chocolate chips for the nuts. Please let me know how that works! Can’t wait to try these. Can I make these with pecans instead of walnuts? Yes you can substitute pecans for walnuts. Yum!